There’s a trend toward the unusual, even the bizarre. That was the horoscope for Mike Torrez on October 2, 1978. But what use could this information have been? Torrez may or may not have read his horoscope that day, but he did go into the game with a plan, at least for the batter who ended up proving the accuracy of the horoscope. He wanted to get him off the plate but being human and fallible failed in his attempt to use a plan to stave off the unusual, even bizarre. The day was undone. Which reminds me, I never finished telling you about Luke Walker. When last seen on these pages, he had just thrown a historic pitch—the first ever in a night game in the World Series—for a strike and was ahead in the count to Orioles leadoff hitter Paul Blair. Things rapidly disintegrated. Blair singled, as did Mark Belanger and Merv Rettenmund, loading the bases with no outs. A passed ball scored Blair, Frank Robinson was walked intentionally, and Brooks Robinson and Boog Powell plated two more runs with back to back sacrifice flies. Down 3-0 in the first inning, Luke Walker was lifted from Game 4 of the 1971 World Series, and a call was made to the bullpen. A tall, thin rookie named Bruce Kison moved toward the center of the diamond. Kison retires the side in the fifth, but in the sixth he gives up two singles with one out. He gets the fourth batter to pop out to third base and then he fires two quick strikes past the potential third out. [Catcher Woody] Huyke crouches behind the right-handed batter and sticks two fingers beneath his glove. Kison flicks his glove fingers. Huyke responds with one finger and Kison nods slightly. Woody then hunches over the outside corner, but before he can set himself Kison flicks his glove again. Huyke shifts to the inside corner and places his glove at a level with the batter’s knees. Again Kison flicks his glove. The catcher raises his target until it rests inches from the batter’s chin. Kison goes into his motion and fires a fastball directly at the spot where the batter’s head would have been if he had not fallen to the dirt. HBP: Etchebarren (1, by Kison); F Robinson (1, by Kison); Johnson (1, by Kison). Those Orioles were simply being served notice that despite Kison’s virginal appearance he was not one to treat idly. Kison had hit a high proportion of batsmen in his three-year professional career. He hit seven batters in one minor league game, which he won. His difficulty stems from a fastball that breaks sharply in on a right-handed batter at the last second. This break is often misjudged and can result in bruised ribs. Also, because his curveball is such a brief affair and anxious batters tend to lean far over the plate hoping to paste it to the right-field wall, Kison must protect himself by firing an occasional pitch inside. This combination of a batter leaning one way and a fastball breaking the other accounts for the knockdowns. There is a feeling among Kison’s friends that he is not particularly upset when he hits a batter, that he feels it helps compensate for his limited repertoire (two basic pitches) and his boyish appearance. Yet, in the fourth game of the Series, he claimed his youthful wildness was responsible for the three hit batters—Dave Johnson, Andy Etchebarren and Frank Robinson. Strangely enough, he did not walk a single batter during that span. Bruce Kison uttered the above quote in 1974, after a game between the Pirates and the Reds. Kison’s pitches had been sizzling under the chins of Reds’ batters all game, and finally in retaliation Reds pitcher Jack Billingham plunked Kison. Billingham was ejected, and manager Sparky Anderson came onto the field to argue the ejection with home plate ump Ed Sudol. During the argument, Anderson stepped on the foot of Pirates’ catcher Ed Kirkpatrick, who reacted by shoving Anderson. At that point, according to the powerless would-be peacekeeper Sudol, swarms from both teams “ran onto the field like animals.” A prolonged fist-swinging brawl ensued. Schmidt: The next time you do that I’m going to come after you. Kison: Why don’t you come now? Within moments, both benches had emptied. Pirates catcher Ed Ott, a former wrestler known for body-slamming and choke-holding fellows during brawls, grabbed Schmidt, and Phillies man-mountain Greg “The Bull” Luzinski grabbed Kison. 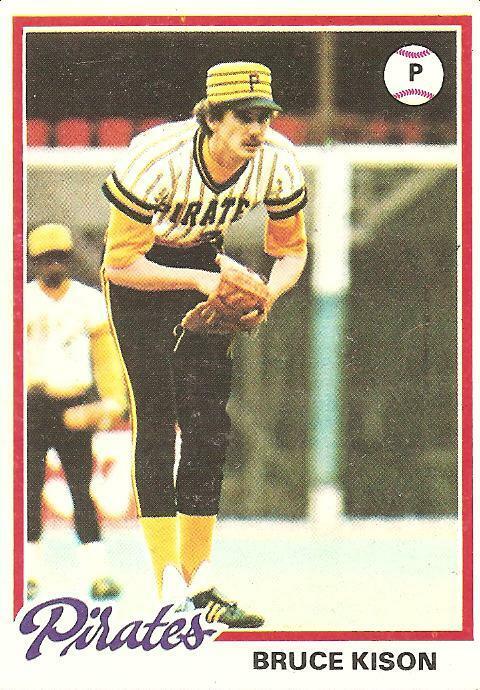 Kison also started Game 1 of the 1979 WS, only lasted a third of an inning, and didn’t pitch again in a series that went seven games. But at least he didn’t hit anybody in that outing. When I think of Kison, I think of the time George (Jorge) Bell tried to karate kick him. gedmaniac: Yeah. I may get into this later, but since you mention it, there’s a funny tendency toward the apocryphal in that Bell-Kison story as it currently exists on the internet–more than one site has Bell missing completely and Kison then coolly decking him, like Clint Eastwood or Nolan Ryan or something, but in newspaper stories about the game from the next day Bell’s kick is described as landing in “a sensitive area” on Kison. Kison didn’t land a punch on Bell, but Bell punched Gedman before the whole thing devolved into scrum-ville, during which Buckner ended up kicking a Blue Jays coach repeatedly. Quite a melee. The picture does show his foot pretty much even with the sensitive area. I feel like I watched this game. Seeing that it was a Sunday confirms that I had a chance–we’d only get Friday and Sunday games on the CT affiliate back then (1985). But I definitely saw the video a lot, and you saying Buckner was kicking a guy sounds very familiar, like it was all caught on tape. I may have the footage somewhere on VHS from some early 90s blooper show or something. I’ll add finding it to my neverending list of things to do. Was actually at the game where Kison hit Schmidt. Summer of ’78, I believe. I lived in Philly and I was in Pgh with my folks looking at colleges. First game I ever went to in an enemy stadium that wasn’t the unfriendly confines of the Vet. Schmitty wagged his finger at Kison first while walking towards first and then lunged Kison’s way suddenly. Makes sense now that I hear Tanner’s description. 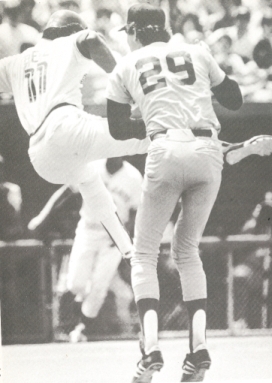 Tug McGraw ejected an inning later for hitting Stargell. Thank God, Pops didn’t get to him! Seesaw game all the way which Pirates finally won in extra innings. Funny how a vivid moment stays with you. Only damn thing I remember about that trip….. I was at the game that October night in 1971 – just turning 10 years old. Kison was a hero of mine from the moment he came up that summer. Milt May got the big pinch hit to win that game. Great memories; thanks for this page!